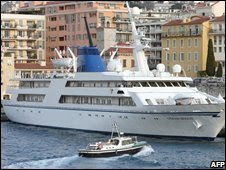 The Miss Patti above broke from her mooring and ended up ashore at the North End. She was able to get off the beach at high tide. Damage was severe to her forefoot and forward keel. She was probably taking on water but didn't really drain much after her haulout. 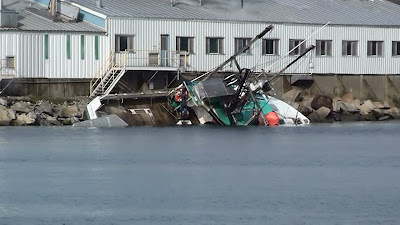 The seiner below faired much worse. She came ashore on the rocks by the Marine Colloids plant. Heavy seas and surf battered her mercilessly well into the morning hours. Winds didn't abate until about 0300. Vessel appears to be a total loss. The wooden double-cabin cruiser below didn't break loose from her mooring but she took on plenty of water, probably from a sprumg plank in her bottom. The Journey's End crew towed her into the slipway. 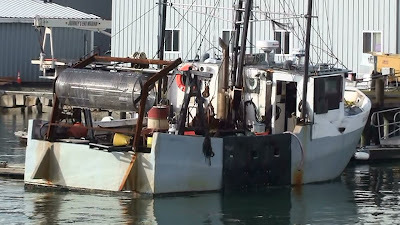 It's hard to believe a few lightly armed outcasts in decrepit Boston Whalers and homemade fiberglass skiffs can take a super tanker and its crew hostage and get away with it. But that's exactly what happened, and it will continue to happen as long as the industry anchors itself in the lee of "reasonable force" and "insurance fears". Every ship or large yacht transiting the east coast of Africa should have a pair of Barrett M-107 50 caliber sniper rifles and a trained crew willing and able to use them. A couple of speedboats with a dozen or more pirates wouldn't get within half a mile of a ship carrying these. 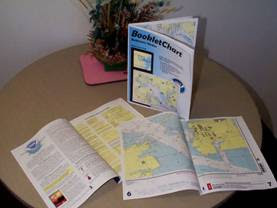 Click on the photo above if you want to try out the new NOAA Booklet Charts. These charts are designed to be printed on regular 8-1/2" x 11" paper. Print them out yourself and staple them together. For the most part, reviews have been very positive. You certainly can't beat the price: They're FREE!